Precisa Moisture Analysis meets the highest international quality standards. Precisa has developed an instruments which not only provides a high degree of precision, but also offers an outstanding array of additional options. EM120 and XM60 will fit perfectly into your IT environment and has integrated USB and RS232 connections to external PC’s and equipment. 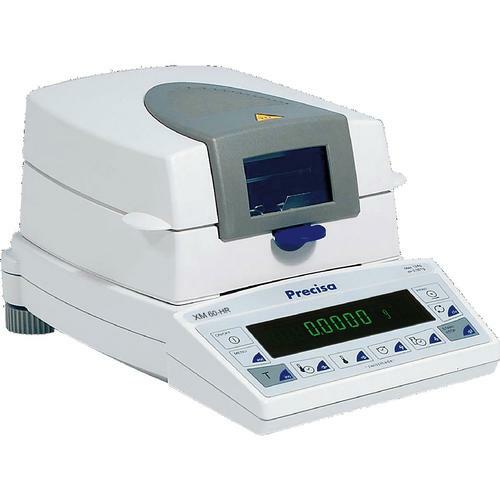 Precisa is settings new standards in the demanding area of high-end moisture analysis. The EM 120-HR provides 0.0001g weight readability, 0.001% moisture measurement, and three heater options – combined with ease of use and sophisticated customizing features. The EM 120-HR is ideal for advanced laboratory analysis in a multi-user GLP/GMP/ ISO lab environment with many diverse moisture analysis applications and requirements for sample processing, throughput and reporting. Graphic User Interface - Full graphic display is easily readable in all lighting conditions. Changeable screen labels allow six “soft keys” to be multiplexed to support all applications without needing to refer to a manual. Real-Time View - The graphic display easily supports three different data views. The three views may be changed while the unit is operating. Weight Loss Plot - may be zoomed to increase screen data resolution. Dashboard – Heat, Time, % Loss. Parameter Check –allows live scroll through parameters to validate active settings. Versatile Connectivity Options - A USB.Type B connector is included along with one bay for optional slide in modules. Slide-ins options include RS232, Bluetooth, WiFi, wired Ethernet, and USB host. Heating Flexibility Heat-Steps™, & Heater Options - Up to 3 separate heat intervals (steps) may be programmed for each method, with a separate weight loss result for each interval. Each interval may have different temperature, heat profi le, and endpoint conditions. Available with either Halogen, Infrared, or Metal heater to best match sample needs & glass-free requirements. Expanded Method Memory Including Method Groups & Batches - The method memory supports up to 100 methods with all user settings. Methods may be grouped by type of sample, etc. Separate batches with separate statistics may be run for each method. Customized Reporting - The EM 120-HR includes as standard reports for calibration results are GLP, GMP, and ISO compliant. The reports may be customized with user text and reformatted to meet inhouse or client needs. Built-in statistical reporting supports batch processing. 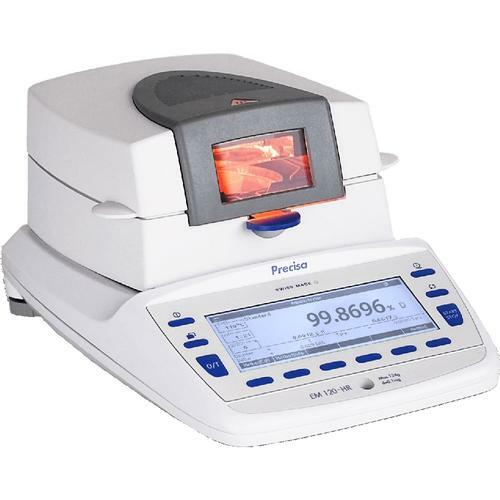 The XM 60 Series moisture balances were designed for everyday high throughput use in the analytical or quality control lab, supporting established product or material manufacturing. The XM series is available in moderate resolution (XM 60 - 0.001g, 0.01% moisture) or high resolution (XM 60-HR 0.0001g, 0.001% moisture). Both versions also offer a choice of heating options (Halogen, Infrared, or glass-free Metal) - to best match the production applications, sample needs, and FDA/HACCP requirements. Resolution choices to match your application - The XM 60-HR - with high resolution, 0.001% moisture, and memory for 20 methods is the ideal product for many high performance industrial applications, including trace moisture in plastics for injection molding. Flexibility in Heater Choice - Three choices for heater; Halogen, Infrared, or glass-free Metal for FDA/HAACP considerations. Choose the best match for your needs to heat as fast as your samples allow - for best throughput and high quality moisture results without decomposition. Connectivity – built-in and options - RS232 is standard, USB is optional. The XM 60 and XM 60-HR are computer and printer ready with GLP/GMP/ISO compliant print formats with date/time stamp. Data is fully formatted for direct transfer to Windows® applications in Excel®, with optional third-party wedge software. Programmable Methods - Up to 20 methods may be set up, stored, and used. Each method will set a target heating temperature, heat rate “ramp” method, and choice of fi ve endpoint (stop) methods including AdaptStop™ - a fully automatic endpoint mode. Heat Rate “Ramp” Flexibility - Heat rate choices of Soft, Standard and Boost provide simple time/temperature profi le management - without requiring ramp programming. Soft, Standard and Boost use temperature feedback to provide slow, standard and high heat rate - each including a different rate of approach to a target temperature. Display views live during heating by user choice at any time.